Grandad is convinced that the house is haunted; Cathy has a new Internet date; Agnes is given a special Christmas tree to cheer her up; and Rory gets plastic surgery. Cathy Brown: [after finding out the date she dumped due to his being short hooked up with Sharon right after] Sharon! Sharon McGoogan: You don't know what you missed. Little jockey... BIG whip! 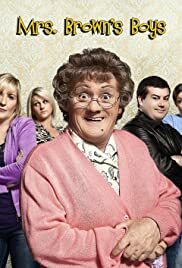 It's become something of a tradition at Christmas, and fortunately Mrs Brown's Boys came as a real tonic, let's face it 2017 has been far from a vintage year in terms of Christmas TV. Fortunately this episode had real quality, it was funny, entertaining and a much needed laugh fest having been made by the family to watch Eastenders (I thought Christmas was a time of cheer.) The story was funny, and of course we had a comedy Christmas Tree, less bold then previous years but still funny. The two highlights had to have been Kathy's date, the diminutive but handsome Jake, and the second being the introduction of Damien Mckiernan as the new Rory. I loved how the character was introduced and I howled at that line 'who the *** are you?' he was certainly given a massive build up, but personally I didn't warm to him, I'm sure given time he'll settle into the role, but Rory Cowan was so naturally funny, he's a tough act to follow. I was expecting a joke about tax evasion, but nothing doing.